The magnificent Star Clipper, on which I am about to sail for 12 days! My most recent visit to Montenegro was a port call while cruising on the tall ship, Royal Clipper. As a travel agent I usually organize a few group cruises or tours each year and I accompany my clients when possible. Our Royal Clipper cruise began in Rome and made port calls in Sorrento, Taormina Sicily, Corfu, Kotor Montenegro, and four places in Croatia including Dubrovnik. Then it made a dramatic early morning entrance into Venice. It was a fantastic voyage indeed! Next month I’ll be reprising that adventure, but this time on the Star Clipper and this time I’ll begin in Athens. For my last travel-agent-tour* I’ll be leading a group of 28 adventuresome travelers. I’ve arranged for some of my group to tour Athens and Pelopennesia for four days prior to boarding the ship. Then we’ll sail to Mykonos, Santorini, Olympia (Katakolon) and Corfu (all in Greece) and on to Montenegro and Croatia for five days before arrival in Venice. I plan to write about my experiences during that journey on this blog so please return here often. 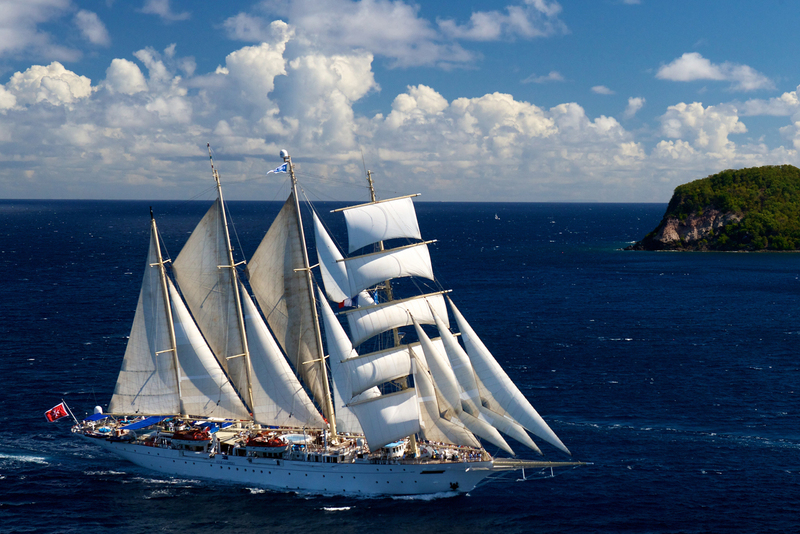 The three ships of the Star Clipper fleet are true clipper ships. The five masts of the Royal Clipper hold more than 50,000 square feet of canvas in 42 sails. At 439 feet in length, the ship accommodates just 227 passengers. The Star Clipper and Star Flyer are 379 feet long and carry only 170 guests. Standing on the top deck under the full sails and under the stars is unforgettable. Passengers who sailed the same itinerary my group will be enjoying in September made a very professional video which you can see on the Star Clippers blog by clicking here: http://www.starclippersblog.com/2014/07/video-from-athens-to-venice/. To view the Star Clipper website, click here. * This is my last tour and cruise as a travel agent. When this cruise ends in Venice, I will be retired! This entry was posted in At Sea, Montenegro and tagged Star Clipper by Libbie Griffin. Bookmark the permalink.